OPEN ARTI — a project by Zero and Vodafone — run for the whole month of May 2012 at La Triennale museum in Milan. 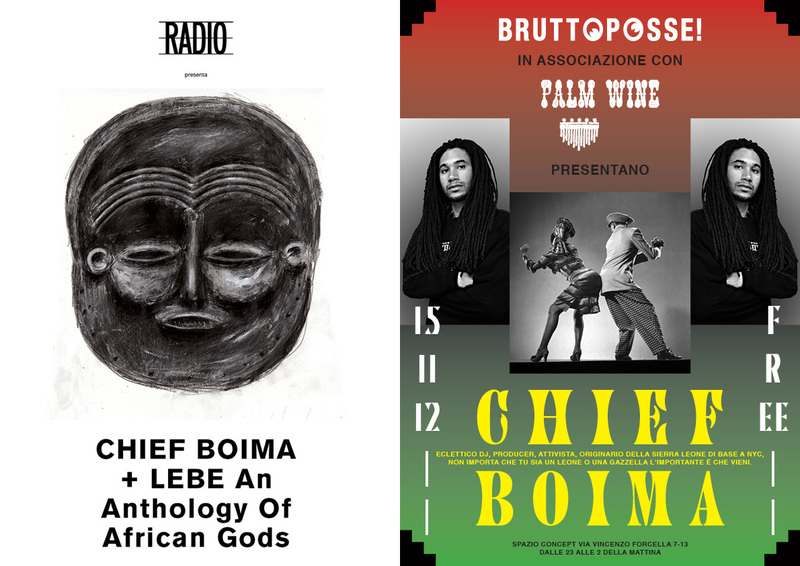 Simone Bertuzzi/Palm Wine co-curated it with Andrea Lissoni, program and general info can be found on OPEN website and on older Palm Wine posts (here and here). Chief Boima opened the dances during the first three days, playing three sets in a row from May 2nd to May 4th, sifting out three different eras of African and African diaspora music: Soukous and Highlife from the 70s and 80s on the first night, Coupe Decale, Ndombolo, African Hip Hop and Reggae from the 90s and 00s on the second, and finally Azonto, Logobi and contemporary African hip hop on the last night. This digital release is the live recording of these three sets of approximately one hour each. Enjoy and spread it! Go to the Palm Wine Blog to see the tracklist and accompanying videos, and click on the dropbox link above to download the whole mixes to put on them on yer iPods. Also, I’ll be back in Milan this Thursday night! I’m playing at an art gallery, and then will be at a club later on in the night.